Steam crab for 15 minutes or till bright red. Shock in ice bath. Pick meat when chilled. In a sauce pan, add the extra virgin olive oil, orange peel, garlic, shallot, salt and peppercorn. Bring to a simmer and turn off. Add the prawns, leaving the heat off, let them confit for 5 minutes or until the shrimp is cooked. Remove the shrimp from the oil and cool in the fridge. Strain the oil and reserve for the vinaigrette. Peel and devein the shrimp. Then split down the middle. 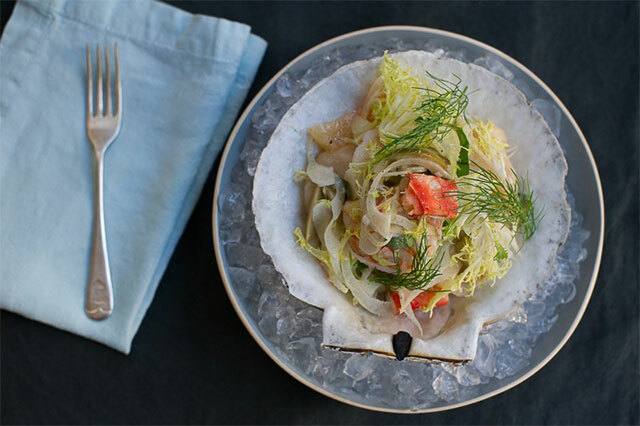 In a bowl add the raw scallops, picked crab, poached shrimp, blood orange segments, torn basil, shallots, picked frisée, shaved fennel, and olives. Season generously with salt and pepper. Dress with the confit oil and blood orange juice. Plate making sure all the ingredients are distributed evenly.